James Shelby of Aiken, S.C. killed this 23+ pound turkey on April 3, 2019. 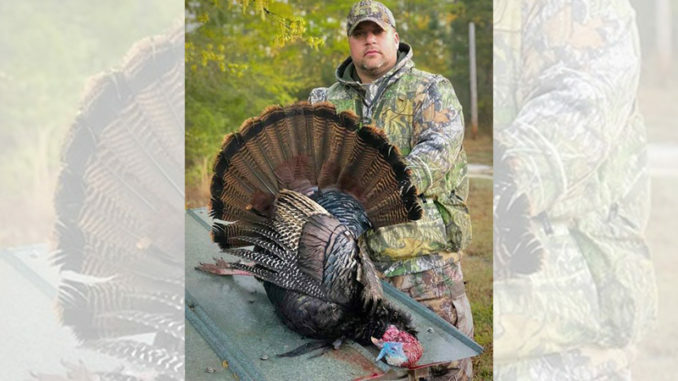 James Shelby of Aiken, S.C. was hunting outside of Monetta on April 3 when he killed a four-bearded 23-pound, 2-ounce turkey around 7:15 a.m. He first heard the turkey gobble while it was still perched on its roost less than 20 minutes before he shot the bird. It was 14 steps away from him when Shelby pulled the trigger. The longest of the gobbler’s four beards was 9.5 inches in length. Its other beards measured 7.5 inches, 5.25 inches, and 4 inches for a total of 26.25 inches. A true trophy bird, it also had 1 1/8-inch spurs. Shelby had located some turkeys on this plot of land before the season started, but they scattered shortly after. He decided to try it out after a few unsuccessful hunts at some of his other hunting places. The gobbler’s four beards totaled over 26 inches in length. “We found some birds before the season started on this particular piece of property, but they disappeared for a while. After no luck at any of our other spots on previous hunts, we went back to this property on a whim,” said Shelby. It was a good call, even though they weren’t set up in exactly the right spot at first. “We knew about where they usually roost and we set up before daylight. But we had to quickly change spots when we realized he wasn’t where we expected him to be,” he said. Shelby was using a Flextone Thunder Chick upright hen, a feeder hen, and a Flextone Creeper Jake with a real turkey fan. With a Woodhaven Classic V3 diaphragm call, Shelby called very sparingly to the big bird. It didn’t need much persuasion after spotting the decoys upon flying down from the roost. “Once he was close enough to see the decoys, he ran in hard the last 50 yards and began to strut and spit around my decoys. He positioned himself between my jake decoy and one of my hens like he was attempting to lead her away. I clucked to get him out of his strut so I could take a clean shot. I barely called to him at all. Only lightly responded to him after he gobbled. It worked like a charm,” he said. 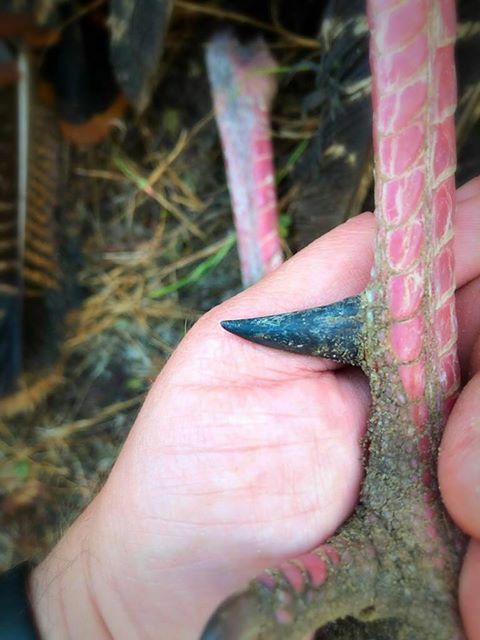 The bird had 1 1/8-inch spurs. 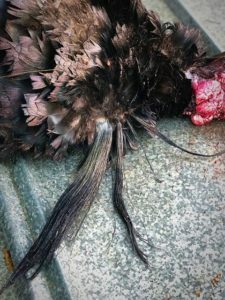 He shot the bird with a Stoeger M3000 12-gauge equipped with a Carlson’s Longbeard XR choke and a load of Winchester No. 5s. He considers himself lucky to have been able to share the hunt with his dad. 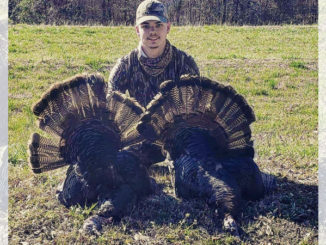 “I was lucky enough to have my dad with me and to be able to share this awesome experience with him,” said Shelby, who is in the process of having the trophy turkey scored.